All transactions are safe and secure with a reliable history in online purchasing behind each of our associates. 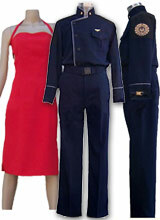 Buy the Battlestar Galactica Costumes to own Battlestar Galactica clothing and merchandise. These Battlestar Galactica uniforms will make you feel like a member of the Colonial Military. You'll be ready to fight alongside Colonial heroes Kara Thrace and Samuel Anders. These Battlestar Galactica costumes allow you to portray characters like Number Six and Admiral Bill Adama. You can even outfit yourself in a Viper Pilot costume. The uniforms are available in a variety of sizes. Get a Number Six costume and an Admiral Adama Battlestar Galactica costume for a stellar couple's ensemble. You can also purchase both personalized and character specific Battlestar Galactica dog tags. In addition to the Battlestar Galactica Costumes above, browse the Battlestar Galactica Clothing Gallery for more apparel like men's and women's clothes, kids shirts or hoodies.